A software program is sometimes the only option that you have; if you cannot increase the memory of the computer, for instance because it is already at its limit, then software may be the only option left. MemPlus is a free program for all supported versions of Microsoft Windows. It supports client and server editions of Windows, and is provided as a portable version and installer. Note that the program requires the Microsoft .Net Framework 4.7.1. The program displays the system's RAM usage and the total physical memory installed on the device on start. You may activate the "clear memory" button if memory use is high to drop it. 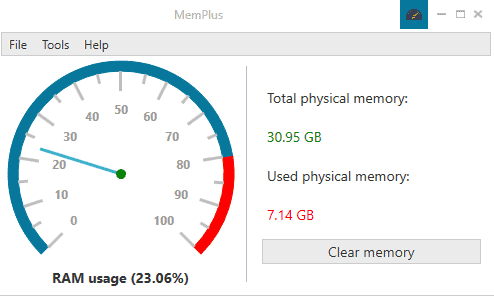 MemPlus clears the memory of non-essential processes when you do. The total amount of RAM that is freed by the procedure depends on a number of factors. MemPlus displays the freed up memory in a popup after the operation completes. It is not possible to disable the popup which is unfortunate. You may need to add certain processes to a whitelist to protect them from the operation. While foreground processes won't be touched, you may notice that other critical processes are impacted by the optimization. Open the preferences with a click on Tools > Settings, and switch to RAM Optimizer to add programs to the list of exclusions. Switch to RAM Monitor when you are done to change the program's update interval and configure automatic options. MemPlus can optimize RAM automatically when memory usage exceeds a certain threshold or after a set period of time. The default values are set to 50% and 10 minutes; both can be changed in the options. The program includes a RAM Analyzer on top of that which displays detailed information about each RAM bank. You may export the data and also logs that the program writes while it runs. 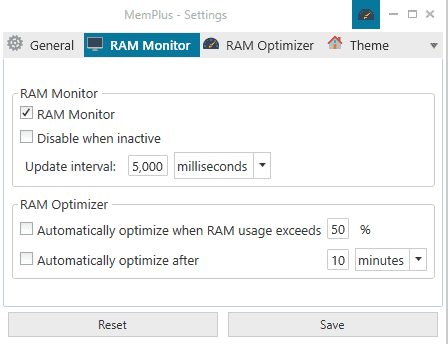 MemPlus reduces the amount of used RAM effectively on a Windows computer when you run it and activate it manually or let it run automatically. It is a valid option for users who work on PCs that hit the RAM barrier regularly. While I'd suggest to increase RAM if possible as you will experience other improvements doing so, it may be an option for systems that cannot or won't be upgraded. Now You: How much RAM does your device have? Is it enough? RAM managers was the snake oil from win98 times, when 32 MB of RAM was common. I think nobody need today this sort of software (up to all, it relies on a very specific version of dotnet). In essence this software was developed, free of charge, to give users a free alternative, which is also open source and actually does what it claims. We’re listening to your review. We’ll add an option to disable the popup message in the next version. Thank you for taking your time to review the application! This. A million times this! The program is free, open source, lightweight, easy to use, not dependent on NET or other libraries, compatible with Windows XP and newer, also available in both x86 and x64, and it can be used in portable mode too! It is frequently updated, and yeah, it is from the same dev that made Chrlauncher. In my opinion the best free program of this type is Memory Cleaner. -Monitors RAM usage and reports minimum, maximum and average (true average, not (min+max)/2). -Reports Pagefile and virtual memory usage. I dislike memclean and would never recommend, it simply will not open if you block it with a firewall, which is hilarious because why the hell should a program like that need internet access to do something so mundane. You are right about that, this is very annoying. There’s certainly some irony in a program designed to free memory requiring the .Net framework – has anybody checked the private RAM usage of this program? This site has hit new lows – how low can you go ? Today reviewing memory managers, tomorrow maybe shady driver updaters ? Very disappointing. Uhm, the program is fine. There’s even a GitHub page with its source code. It would not be my first choice (Mem Reduct by Henry++ is just better by being simpler), definitely, the UI is hideous and it wastes up too many resources (how ironic, why not use Windows native chrome?? ), plus it depends on NET, and on an absurd version of NET, not even a sane one; all that said, the program seems to work and you even have its source for you to look at, so if anything “shady” is not the word to describe it. @jNizM: I love AHK, and if there’s anything that can be done using AHK, that should be the route. 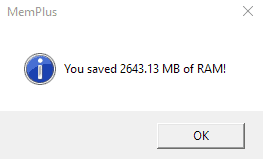 Tried it out on Win 8.1/64-bit with 6Gb RAM: PC was @ 58% usage, was reduced to 28%. Sorry to say this but Windows 10 defender Blocked it as Trojan horse ???? Yes, there’s something weird going on with Windows Defender. We’ve already submitted our sample which was considered clean. Perhaps try updating to the latest definition updates? RAM cleaners, RAM defragmenters are not useful. They slow programs and they clear cache memory so access time for frequent files is much much slower. It’s surprising and disappointing to see an uncritical review of this software here. Perhaps there are edge cases but normally, an operating system will use all the available memory for something useful or potentially useful and then immediately relinquish some to write new relevant information to replace unimportant data as required. Seeing unused memory may be comforting to the less knowledgeable but having purchased it, using it is a lot better than watching it sit there doing nothing. Crashes on launch, Windows 7 x64. I’m sorry to hear. We tested our build on a WIN7X64 machine, fully updated and it worked fine. Could you send us more specifications? As soon as I launch it I get this error, then this black rectangle shows up, I’m assuming that’s where the program is supposed to be. Could you send us an e-mail about this?